The Anubias Nana is a lush flowering plant usually growing alongside riverbanks in western Africa. In the wild, it rarely grows entirely submerged; instead, it can be found rooting on logs or large roots, semi- or fully immersed. This plant has wide, pointed leaves in a dark green shade, which usually grow in low clumps. The center vein is very visible, with diagonal lines running from the center to the leaf edge. 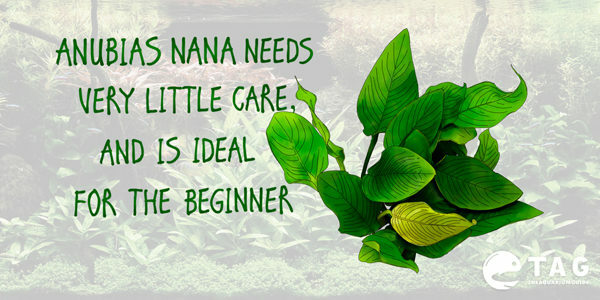 The Anubias Nana will thrive in many living conditions making it a suitable aquarium plant for patient beginners. It will do quite well in low light (less than 1W/gal), as well as strong one (over 4 W/gal), but medium light will be the best choice (about 2-3 W/gal). It prefers slightly acidic to neutral water, with pH between 5.5-7.5 and temperatures between 72-85 degrees Fahrenheit. Substrate has to be well fertilized and have a medium size (1-2 mm coarse sand or 2-3 mm) gravel, as smaller substrate won’t help with anchoring the roots and larger ones collect a lot of debris. Planting the Anubias Nana on rough rocks or pieces of driftwood is the best option, as it will thrive when light reaches its root system. Although it will develop intricate root systems below the substrate, burying it completely will slow its growth even more or may even make it rot. Tie the roots around the rock or driftwood using a piece of dark thread, a rubber band, or fishing line and leave them there until you notice the roots are well-attached. You may want to remove the rubber band eventually, as it usually shows up and looks out of place. This is why most aquarists prefer to use a cotton thread since it will dissolve over time and won’t disturb the tank set up. Due to their large leaves, the Anubias Nana makes a good mid-ground plant, but can also be used in the foreground of very large aquariums if trimmed constantly. The Anubias Nana doesn’t require much special care, as it is a pretty hardy plant that will thrive even in the poorest conditions. Plant it in a shady area in the tank, to avoid algae development on the leaves. These slow growers need constant fertilizing and CO2 supplements to help it stay healthy and in shape. Trim back all dead or almost dead-looking leaves very close to the rhizome (stem). Don’t be scared if you need to trim most of the leaves; this plant stores all nutrients in the root system and will sprout new leaves. They will grow at a very slow rate, reaching full size in several years and it is a known fact no light or CO2 supplement will enhance growth rate. 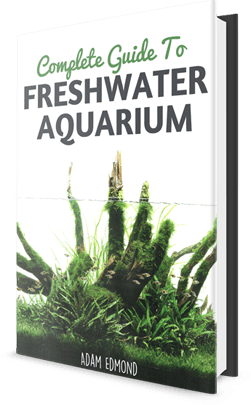 This aquarium plant will propagate naturally by developing small tips from existing rhizomes. To separate a tip, just cut a rhizome section with a few already-grown healthy leaves using a very sharp knife, razor blade, or pair of scissors; then replant it anywhere you want. It is necessary to remove growing tips occasionally to allow light to reach the main rhizome. This will ensure the plant stays healthy and receives all its nutrients, thus being able to produce food for the plant. Plants allowed to grow immersed will produce seeds, which are another way of propagating the Anubias. Actually, this is not really a submerged plant, but it can still thrive this way. This is also the reason for its slow growth rate in the tank, compared to the Anubias growing immersed or semi-immersed. The hardy Anubias Nana will resist most herbivore fish, as it seems they don’t find it too tasty. Its thick, leather-like leaves are almost indestructible even by the ambitious goldfish. Herbivore cichlids also avoid nipping at the Anubias and it can even be placed in larger terrariums with patches of water. Due to its large size and lush look, the Anubias Nana may well be used as a species-only plant in the tank, especially in medium and smaller tanks. If you didn’t know what to plant near your salad-eating fish, the Anubias Nana may just be the choice. Just don’t forget to fertilize it constantly and add CO2 to help it grow faster. You can find the Anubias Nana in most aquarium supply stores in small clumps or already attached to bogwood, so all you have to do is place them in your tank.